The Madison Park Brianna 6-piece Quilted Coverlet Set is the perfect update to bring beauty and grace to your bedroom. An over-scaled printed floral motif, in aqua and white hues, adds a soft accent to the grey cotton coverlet. The solid grey reverse provides rich touch of color to complement the top of the bed and the cotton-rich filling offers exceptional comfort and softness. Coordinating shams with a floral motif pair beautifully with the coverlet, while three decorative pillows with embroidered details and fabric manipulation complete the ensemble. Machine washable, this cotton coverlet refreshes your space with its casual elegance and charming allure. The Brianna Aqua Quilt set comes with everything pictured including the three throw pillows. It washes and breathes well since it is 100% cotton. Please be advised that the quilt might be shorter on the sides than you expect. 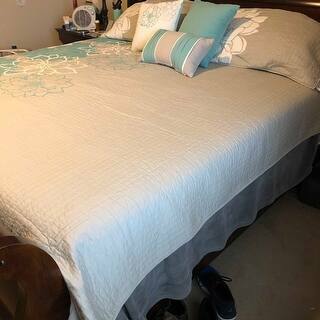 My previous queen cotton quilt was 94 inches wide and this is only 90 which makes a big difference as there is a 2 inch gap on either side where my box spring shows now. I was looking for something in a light cotton with a "Floridian" design and found it in this coverlet. 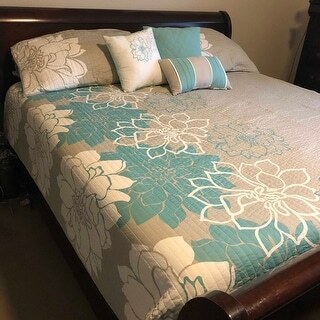 Made of cotton and beautiful splashes of aqua made it the perfect piece for me; it also came with shams & 3 lovely accent pillows. P.S. 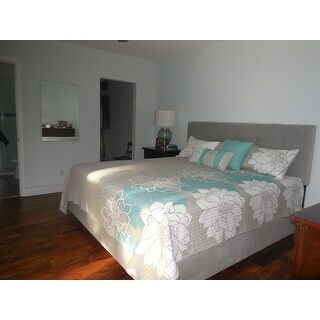 My beautiful king size bed with tufted headboard also came from Overstock! Highly recommend! While the colors looked like they'd fit well with our other bedroom decor, I thought the set might look a little dull compared to what we were replacing. I was very pleasantly surprised to find that the colors look serene and lovely, and that the ensemble looked great right out of the box. The only thing that disappointed me is that the back of the coverlet is not the "clean white color" that the description indicated it was. It is plain gray. If the manufacturer has changed the design, Overstocks needs to reflect that. Still glad I purchased it, though. This is so beautiful ! Added the right touch to our newly painted bedroom. I would also like to add that the coverlet is so soft and really comfy! Highly recommend. I loved the picture, and I love the comforter. It's perfect for summer nights, and probably into the fall. Colors are gorgeous. There were 3 (!) extra pillows with it, although only use one and I gave the other two away. My only caveat would be if I had a king-size bed; the comforter is a king size one because I need to tuck it in against the wall side (very small bedroom) and I have a queen bed. I don't think it would fit without a bedskirt if you used it on a king bed. This bedspread is very attractive. The stitching is set a one inch apart and runs the full length of the spread. The pillows are a great contrast and the color combination are perfect for my Condo in Mexico. 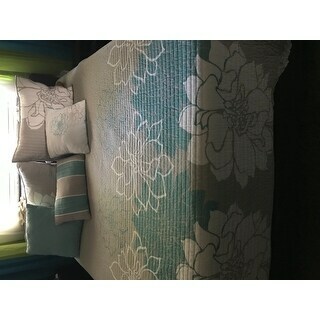 We got this 6 piece set (quilt, 2 shams, and 3 accent pillows) for our guest room and it looks great. It's cute and stylish without being overbearing and is also neutral enough that I don't feel like I can't decorate around it. THE QUALITY OF THIS QUILT IS VERY GOOD. I HAD TO SEND IT BACK BECAUSE IT WAS REPACKAGED AFTER SOMEONE HAD WASHED IT. DID NOT WANT IT ON MY BED. THEY STILL MADE ME PAY FOR RETURN SHIPPING THOUGH...PROBABLY LOST MY BUSINESS. So nice, soft cotton and it looks really pretty! Very happy w this purchase! Great fit... great color and pattern, nice weight!! Perfect for Florida’s 2 seasons!! Washes great! My favorite blanket for the summer. It is beautiful and well made. The color is beautiful. Green and a gray. I use this blanket in the summer. I get cold sometimes in the middle the night so it will keep me warmer but not hot. I like it ! This set is beautiful. I love it and my 10 yr. granddaughter loves it since this done for her. Everyone is happy. We love the way our bedroom looks with this coverlet on our Cal King size bed. We've put it in the washer, dryer and back on the bed several times, and it looks great!. It wears well. Wish it was a little bit wider. "IS this quilt ALL 100% cotton?" No, this is 90% cotton. "Is this a good weight for Summer? Not too hot?" Yes this is perfect for summer. It is definitely lighter than a comforter but I live in Hawaii where it gets hot even with just a sheet. But the weight is exactly what we wanted, it's not too heavy at all. Its a beautiful quilte reviews were good and price.